Maggots make for an exceptionally effective carp bait in winter. Here we run through exactly how to make the most out of them. As the temperature drops, the carp’s metabolism starts to slow. This has two consequences; they eat less and are far less active. Despite this, the carp will still feed, often on a mild day or due to low-pressure. Regardless of the reason, it’s key that when the time strikes, you offer them something they find attractive. Regardless of the reason, it’s key that when the time strikes, you offer them something they find attractive. When the water is clear, carp are much more selective in what they eat, personally I like to fine down everything I use, including baits and end tackle. Maggots are an important weapon in my arsenal. They’re small, so they don’t fill the fish up too much and carp find them very enticing when on the lake bed. Over a number of years I’ve had huge success on the venues that I regularly fish using bunches of maggots on a hair rig, especially when combined with PVA bags of maggots. Casting small bags frequently to my spots works just as well, or even better than consistent spodding. When fishing maggots I usually mount them on one of two rigs. Both of which are based on the same principle – keep it simple. 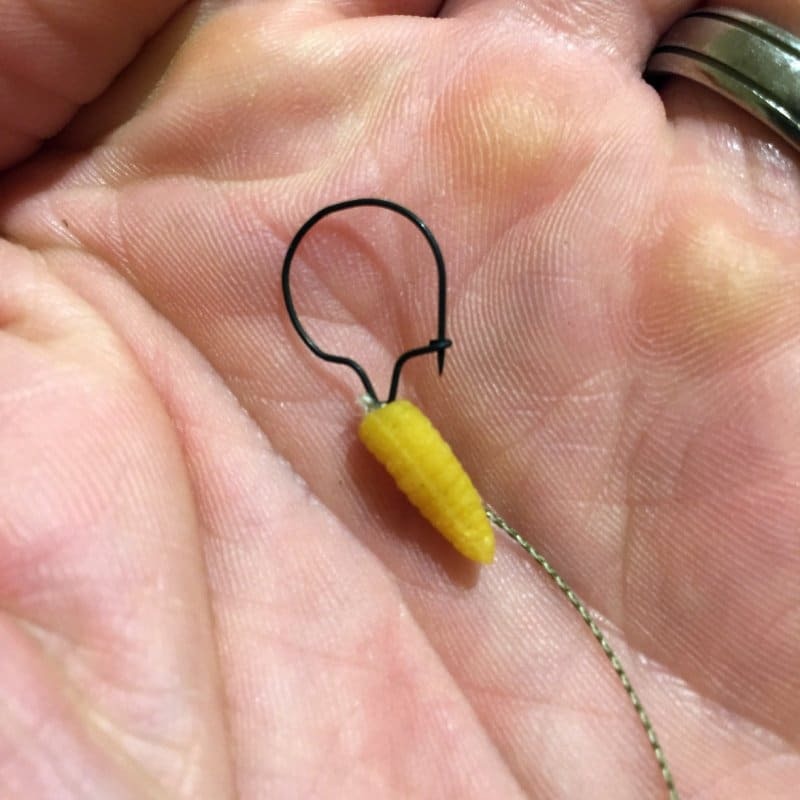 So many anglers nowadays overcomplicate their maggot presentations, but there is really no need to. Start by tying a small, micro rig ring to a length of braid. Next, thread a rubber maggot onto the braid so that it sits just above the ring. This makes the rig more appealing to carp whilst also providing buoyancy. This simple additional also stops the hair from wrapping around the shank, due to its rigidity. Next whip a knotless knot, use a very small section of silicone tubing to keep the hair held to the hook. Instead of having an actual hair, a rig ring is used to mount the maggots on and is positioned below the shank. Use a length of line, fine cotton or even dental floss to thread through the eye of a fine sewing needle. Next, gently thread 20 or so maggots onto the line/floss, being careful not to burst them. You will be left with something that vaguely resembles a washing line, with the maggots all hanging in a line. To bunch them up, tie a granny knot in the line to form a ball of maggots. This ball is then tied to the micro rig ring with a few granny knots to hold it in place. Lastly trim the tag ends of the material and off you go! This second rig is one that has gained popularity in recent years and is tied in a similar way to the previous, Medusa Maggot Rig. Attach the klip to a length of braid and whip it on knotless-knot style. Securing it in place with a small section of silicone tubing is always worth doing. Attach a hard, rubber maggot above the klip is great as it helps to prevent tangles. At this point, your rig should look something like this. Once the rig has been tied and the klip attached, open the clasp and gently thread maggots on one at a time, being careful to not burst them. Including a slice of cork to the klip will add buoyancy to the rig. Keep threading the maggots on until full, then close the clasp and you’re good to go! Using soft, supple braid in both of these rigs is a requirement as it gives the bait the ability to appear natural when on the lakebed. With that said you must pair it with a bag, otherwise it will tangle. Another great tip for keeping the hooklink on the lakebed is to rub rig putty up and down the braid. This will cause bits of the putty to stick to the fibres in the braid, increasing its weight and keep it on the lakebed. Actually introducing maggots into your swim can be a bit of a challenge. In my experience I have found the most success with a catapult, spod or a PVA bag, depending on the water that you are fishing. Continuous spodding works very well on commercial, heavily stocked venues. I have found a mixture of maggots, pellets and hemp to work exceptionally well on such waters. On challenging venues where you are just looking for a single bite, try regularly recasting PVA bags. They are small enough to not fill up the carp, but big enough to entice a take. Not only this, but they allow the maggots to remain in a tight group around your hookbait. Not only this, but they allow the maggots to remain in a tight group around your hookbait. To achieve this, slide the maggots into a PVA stocking tube and form a small bag. Make sure it’s as tight as possible, as this will ensure the dissolving PVA will disperse the maggots very precisely across your target area. Instead of trimming the PVA tight to the knot, leave a long trailing tail. This is where you will attach your hook point before casting, rather than directly into the bag. If you are fishing at short-range, I like to catapult small stocking bags over the top of my hookbait. This starts the carp searching out small bags of maggots – just like the one that is next to your hookbait. Only use small bags. A small maggot bag positioned at the edge of the lake is very appealing to carp, due to the limited amount of food. There is a myth that when maggots are on the lakebed they crawl away and burrow into the mud/silt. This is not true. Due to the cold water they merely lie in an apathetic state, waiting to be engulfed by the carp. 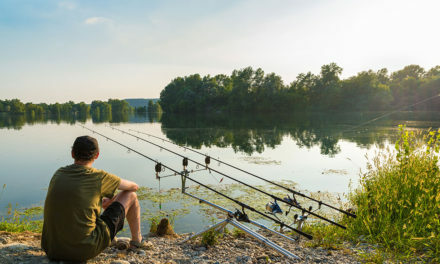 Just as with all carp fishing, you need to be able to identify exactly where the fish are in the water, if you want to have a decent chance of catching them. You cannot simply sling out a maggot bag anywhere and reel in a 40-pounder. More thought is needed. To give you a good chance of success, plumb areas of the lake where the topography shows drastic changes – choddy areas, shelf drop-offs and silty gullies all provide the carp with winter food sources, so maggot bags in these areas can really work wonders. Despite maggots being highly effective on many waters, you should stay away from using them on venues that hold an abundance of nuisance fish, such as roach, bream or tench. It turns out carp aren’t the only fish that love maggots. Recasting maggot bags every couple of hours or so is an approach that can crack even the trickiest venues. It attracts a continuous stream of carp into the swim, and not just small ones. Whilst my preference is to use maggots during the winter months, they do also work very well throughout summer, providing their aren’t shoals of silver fish around. Put simply, they can provide something that other baits just cannot and when used well can outwit that wily monster that just won’t pick up a boilie. They’re definitely worth giving a go. Whites, reds or a combination of the two, it’s worth experimenting to find out which colour catches, as it differs from venue to venue.